During our country's worst economic depression Singer decided to launch a new product -- the Model 221. This marvelous machine was truly portable! Featherweight Parts in the online store on this web site. "Nova Montgomery was a speaker and did two days of workshops for our quilt guild. 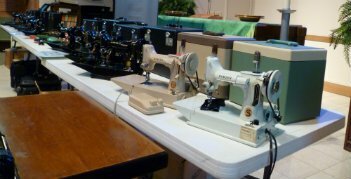 Her lecture was on the history of the Featherweight sewing machine. She was very informative and interesting." Click here to be taken to Nova's online store for quality Singer Featherweight 221 Parts.